We've been back to Squamish three times now over the years, and we're not done with it yet. It's probably our favorite climbing destination, near or far. Why? 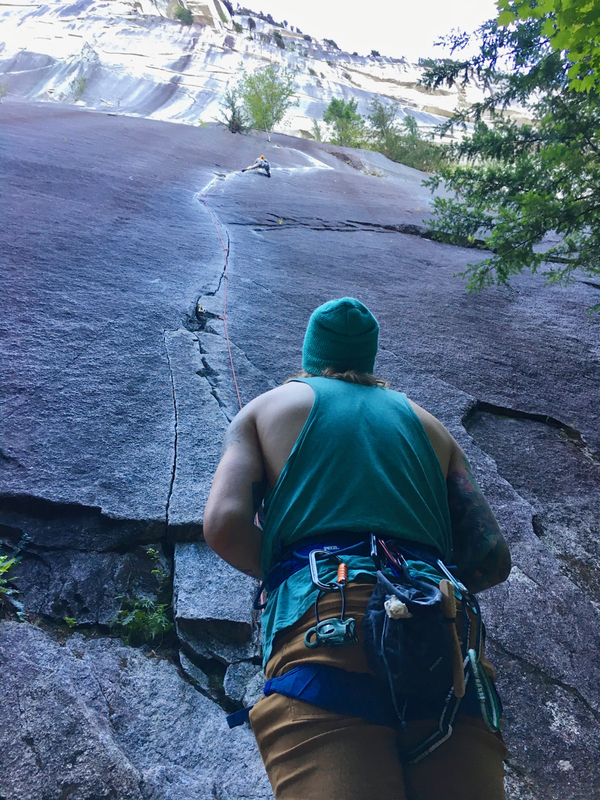 Squamish has world class crack climbing and bouldering at every grade. Sport climbing has dramatically expanded in recent years, making Squamish truly a full service destination. It also has a cool town, easy camping, and pretty darn good weather for a mid-summer trip. In our case, we go to Squamish primarily because we love to climb cracks, and we love to climb long routes. The density of quality cracks and the selection of routes at all grades is beyond compare. I don't think even Yosemite or Indian Creek compares. Yosemite has the big walls, but the total selection of climbs is smaller than at Squamish. Indian Creek is amazing - but is mostly short routes, and does not have the diversity of styles, grades and route length that you will find in Squamish. Red Rocks is definitely in the running as a competitor, but with fewer classic crack routes. There is plenty of info available on Squamish - a new guidebook was published in 2018 (Squamish Rockclimbs, by McLane and Boyd). 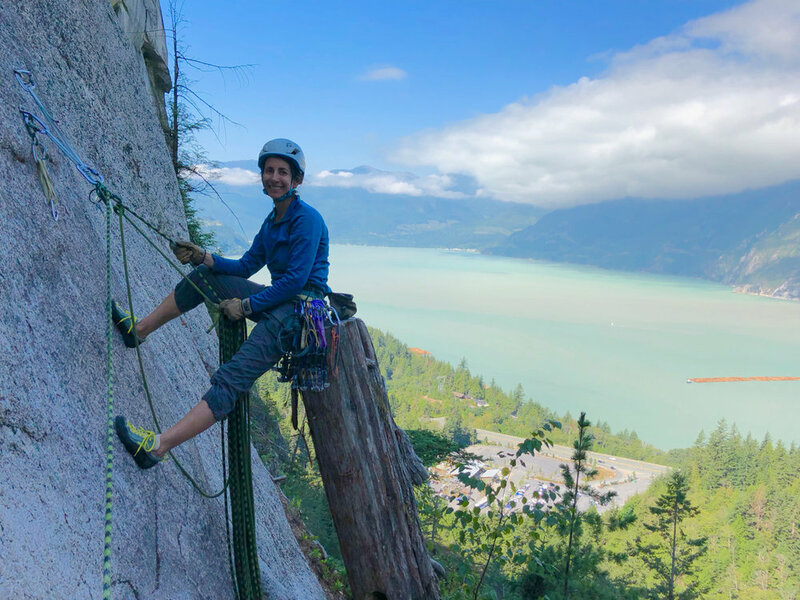 It covers primarily the original Squamish crags and does not cover many of the new sport climbing venues that are scattered up and down the valley. The 2012 Squamish Select guidebook (Squamish Select, by Bourdon) is also very helpful. Obviously you can get all the route info you need form the guidebooks or on Mountain Project. Here are a few words on our favorite areas. The Chief. The home to many of the long classic routes, but also home to many shorter classics and world class bouldering in the forest below the cliffs. There is something for everyone here. One highlight for us - the Chief has a series of incredibly good, one or two pitch 5.10 to 5.11 crack routes scattered along its base. A tour of these routes alone is worth a trip to Canada - and would include Seasoned in the Sun (10a/b), Apron Strings (10c), Exasperator (10c), Arrowroot (10b), Rutabaga (11a), Rainy Day Dream Away (10c), and A Pitch in Time (10b). There are many, many other great routes, including a lot of 5.11 and 5.12 super classic long routes. The Apron area contains many classic moderate routes that are 5-8 pitches long. On Exasperator (5.10c), at the base of the Chief. 160 feet of perfect crack from thin fingers to thin hands. A belay mid way allows you to break this into two pitches, or rappel the route with a single 60m rope. Don on Arrowroot (5.10b). The upper part of this pitch is an excellent off-fingers splitter. Karen leading the classic third pitch dihedral on Diedre (5.8) on the Apron. On yet another classic - Calculus Crack (5.8), on the Apron. Karen at the awesome second pitch belay on Wiretap (5.10a). This excellent route is usually done as four pitches. It is located in Olesen Creek Canyon, between Shannon Falls and the Chief. Malamute. This relatively small area across the highway from The Chief has a lot of great routes from 1-3 pitches. It's also perched directly above Howe Sound and has great views of the water. It can reportedly get more wind than many other Squamish crags - but we didn't have any issues in our time at this crag. There is a ton to do here, once you understand the crag. It’s hard to see the routes and scope of opportunities the first couple of times you visit, since you approach from above. Karen enjoying the view at the belay atop High Mountain Woody (5.9), at the Malamute. Shannon Falls. Many good 1-5 pitch routes. Classics here include Skywalker (5.8), Chewbacca (5.10a), Klahanie Crack (5.7), Local Boys Do Good (5.10d) and Jump to Lightspeed (5.10c). After you reach the top of these routes, make sure to visit the waterfall that lies above. Hike back into the forest until you hit the obvious climber's descent trail. Go uphill until you reach the falls. It's only a few extra minutes to reach the falls and is well worth the trip. Smoke Bluffs. Super easy access and hundreds of excellent one pitch routes. Mostly cracks, but a few slabs and steeper sport routes. This is a good place to practice your crack technique and get used to the rock at Squamish. Crowded on weekends. Avoid the crowds by climbing early to late in the day. Murrin Park. Great sport climbing at the Pet Wall - mostly 5.11 and up. A smaller selection of crack classics than in some other Squamish locales, but well worth a visit. Arrive early, especially on weekends, as the parking lot is small, and the lake here attracts many families. Great for a swim after a warm day at the crags. Other areas. We haven't spent much time at some of the sport climbing areas that mostly lie up canyon from town. But there is a ton here to enjoy, and you can focus completely on sport routes if that's your preference. There are a number of newer, longer sport routes up canyon, and also many one pitch routes at all grades. Search online or in the Select guide for Area 44, Chek Canyon, Crumpit Woods, Brohm Lake and around Whistler. There are many camping options. Your best choice may be dictated by your arrangements (sleeping in tent or car), and your access to a vehicle. Be careful if you are looking to camp for free; It's a bit of a sore spot with locals, and the rules seem to be inconsistently enforced. 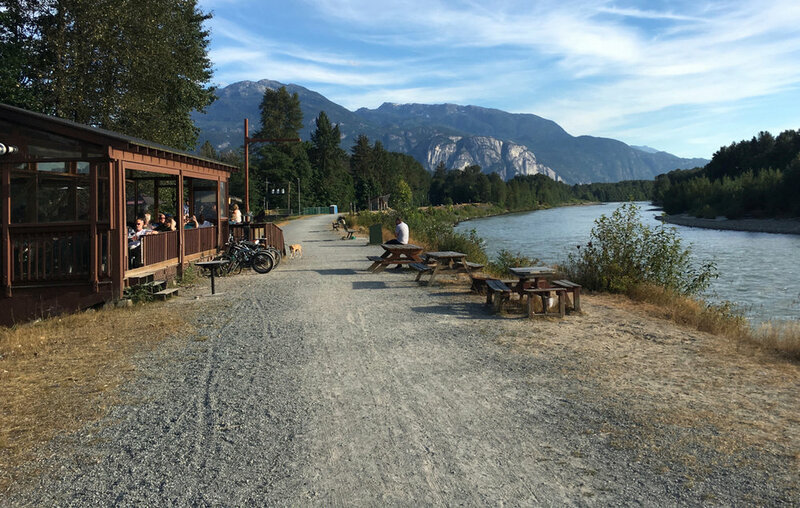 If you are new to Squamish, I'd suggest you drop by the Squamish Adventure Center (on Loggers Lane, near the Smoke Bluffs parking) when you arrive. Here they have helpful people who can give you a local map, info on campsites, climbing, shopping, etc. Many of the people who provide info here are climbers/bikers and can answer just about any question you have. There is also a nice coffee shop and wi-fi in the Adventure Center. Chief Campground. This campground is located right at the base of the Chief, and is in a gorgeous, cool, shaded forest. It is also the campground most densely populated with climbers - so is a good place to look for partners. Most of the sites are walk-in (58 sites). All of the walk-in sites are quite a distance from the parking. There are some car camping sites (16 sites), but they vary in quality - some great, some pretty bad. In my view, this is a good option if you will stay in a tent, want to be around other climbers, and want to be walking distance from climbing. It's a bit louder and more densely populated than the other campgrounds. Town is a couple of miles away. As of 2018, sites can't be reserved in advance. Water, bathrooms, communal cooking areas. No showers. In 2018, $10/person per night. Camping at Kinsmen Municipal Campground. Kinsmen Municipal Campground. This is a municipal campground located next to the town recreation center. It is a pretty simple flat grass campground with 30+ sites. There is good shade in some sites, but others are exposed to the afternoon sun (stay farthest west for best shade). No reservations, but not crowded and easy to get a site. Fills up on Friday and Saturday night. Some nice things about this campground are that it is close to town (about 1 mile), usually very quiet, and is right next door to the recreation center, where you can get a shower, swim in the pool, or soak in the hot tub (there is a small fee for pool.shower access). We've stayed here for the past two years and would stay here again. About half the people that stay here are climbers - the others are mountain bikers and general summer vacationers. A great option if you are sleeping in your vehicle. But it's not in the beautiful forest like the Chief campground. Water and porta-potties only. You can also use the bathrooms as the recreation center. 14 day limit (but you can leave for 3 days and return). About $26 per night, per site. Mamquam River Campground. A new campground located only about a mile from the recreation center. Some nice drive-in sites, and some walk-in sites. We stayed here for a few days this past season. Mostly nice dispersed sites, some in the forest. Easy, informal process to select a site. Bathrooms, but no water, so bring your own (you can fill up on water at the Kinsmen campground). Slack lines and communal area in the center of the campground. Walking distance to the Mamquam River, which is quite beautiful. 14 day limit. Chek Canyon Campground. We have not stayed here, but many climbers who are climbing along the canyon stay here. It's about 15 miles north of Squamish, and close to the sport climbing in Chek Canyon. Others. There are several private campgrounds in town our nearby. Check at the Adventure Center if the above options don't work out. Squamish has pretty much all the amenities you need. There are two full service grocery stores in the center of town, and also a good selection of drug stores, gas, etc. If you want any beer/alcohol you will need to visit the state liquor store, located in the same parking lot as Save-On Foods. The best climbing store in town is Climb On, located on Second Avenue, near Save-On Foods. Climb On has a great selection of just about any climbing gear you need (guidebooks, trad gear, big wall gear, clothes...everything). I think they sell more climbing shoes than any other store I've been in. There is a farmer's market on summer Saturdays. Look around town for more info. The downtown area, and the surrounding area have some good restaurants. Here's a few of our favorites. The Watershed Grill, north of town in Brackendale, with the Chief in the background. Watershed Griil. Located in Brackendale, a few miles north of Squamish. Quaint little place along the river. A bit sunny on the patio in the afternoon. The patio is best on a cloudy summer afternoon. Decent food and good atmosphere. Fergie's Cafe. Also located north of town. Search for it online to find the location. This is a breakfast/lunch place, and definitely our favorite restaurant in the area. Well worth a visit. Great, fresh food and tantalizing menu. Gorgeous tables in the garden. Unfortunately closed in summer 2018 due to a fire. Hopefully it will re-open (website says they plan to re-open in 2019). Howe Sound Brewery. Located downtown. Nice, fun atmosphere and locale. Good local brews and excellent pizza. The other food options had mixed reviews from us. Can get crowded, especially on weekends. Zephyr Cafe. Good, fresh food and excellent coffee. Another of our favorites. High bandwidth wi-fi for rest days. Nice location along the main street in downtown. Backcountry Brewing. Good beer selection. Some food options, but mostly a brewery/bar. Caffe Garibaldi. This is the cafe located inside the Squamish Adventure Center. Good coffee options. Pastries and gelato too. Nice place to hang out after climbing. Wi-fi too. There are a few other popular places that we have not visited yet - The Copper Coil (downtown), The Salted Vine (downtown, kinda pricey), and Fuel+Forest Cafe (north of downtown, in the Garibaldi area). There are also many chain and fast food options.